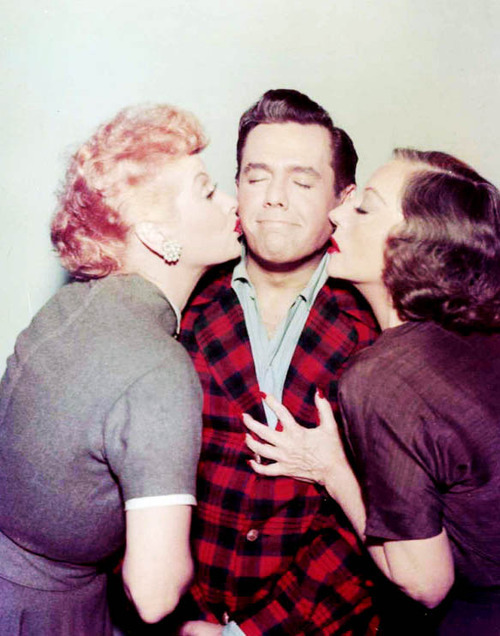 The Five Best Episodes of THE LUCY-DESI COMEDY HOUR | THAT'S ENTERTAINMENT! Welcome to another Situation Comedy Tuesday! Following our six-week coverage of the best episodes from I Love Lucy, we’re continuing with the five best episodes of Lucy’s 13-episode follow-up series, The Lucy-Desi Comedy Hour. The Lucy-Desi Comedy Hour was essentially an hour-long continuation of the I Love Lucy series, airing once every other month from 1957 to 1960. 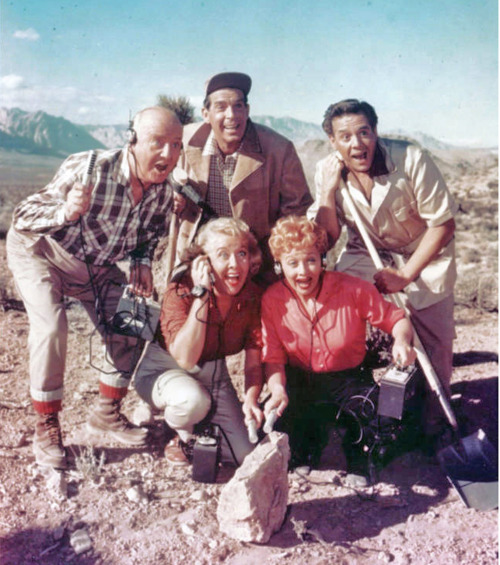 The entire original cast reprised their roles in 13 hour-long episodes that were originally part of The Lucille Ball-Desi Arnaz Show (re-titled The Lucy-Desi Comedy Hour in syndication). 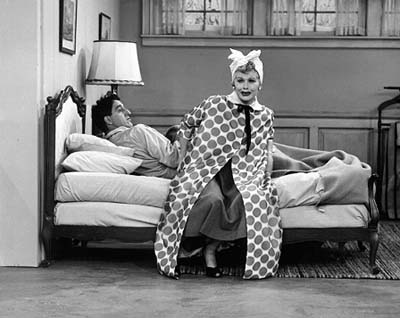 However, unlike the I Love Lucy series, each episode featured at least one famous guest star, and the stories revolved around Lucy’s interactions with that celebrity. The Lucy-Desi Comedy Hour stars LUCILLE BALL as Lucy Ricardo, DESI ARNAZ as Ricky Ricardo, VIVIAN VANCE as Ethel Mertz, and WILLIAM FRAWLEY as Fred Mertz. With KEITH THIBODEAUX as Little Ricky. Considered a step-down from I Love Lucy, these episodes, though initially seen frequently in summer reruns, have never been played as often as the superior half-hour shows. Though the quality of the series decreases dramatically from 1957 to 1960, there’s still MUCH to be enjoyed here; each episode offers at least one moment of unabashed hilarity. It’s Lucy, after all. But this was a comparatively easier list to make since there are so few episodes to choose from. So, I have picked five episodes that I think exemplify the series’s strongest installments. For new fans, this list will give you a place to start. For seasoned fans, there might be a few surprises. When Tallulah Bankhead moves next door, Lucy enlists Fred and Ethel as hired help at a formal dinner. Despite a disastrous evening, Tallulah agrees to appear in Lucy’s PTA show. But a fight between the two divas leads to an onstage battle of the upstagers. Written by Madelyn Martin, Bob Carroll, Jr., Bob Schiller, and Bob Weiskopf. Directed by Jerry Thorpe. This is my favorite episode of the hour-longs. One of the few that takes place entirely in Connecticut, this episode feels the most like an I Love Lucy. Tallulah Bankhead, a classic diva, is loaded with personality and gives a fabulous performance. One of my favorite bits is Lucy explaining to her what the PTA is. (“P-T-whaaaat?”) The first half of the episode concerns Lucy’s attempts to masquerade the Mertzes as her hired help. Vivian gives, as usual, a masterful performance. The second half concerns the PTA show that ends in a fantastic climax. The DVD is inexplicably missing an important scene where Tallulah reveals her allergy to strawberries, but the scene is available on YouTube, and should be included in an upcoming Blu-ray release. Though reportedly a pain to rehearse (Tallulah could be difficult), this is an INCREDIBLY funny show — worthy to stand alongside any I Love Lucy episode. In Vegas, a gag newspaper sparks a uranium rush, as the Ricardos, the Mertzes, and Fred MacMurray head to the desert to strike it rich with uranium. But when they actually find uranium, it’s a race to see who can get to the claims office first. This is the first hour-long episode to go on location, and the first to feature Lucy’s new short hairdo (though she wears a short wig to cover up her actual short hair). The plot concerns Lucy’s determination to go uranium hunting. A phony newspaper headline leads everyone to believe the area is rich with uranium, so the foursome and Fred MacMurray go hunting in the desert. They find some uranium and decide to split the profit. But greed and misunderstanding leads to a huge on-location car chase to see who can get to the claims office first. Though most of the episode is shot single-camera without a live audience, this is a screamingly funny episode with wonderfully nasty performances by everyone. Ethel actually gets the most to do, and she steals the show again. MacMurray is a capable guest star, and the script is well-written. Lucy and Ricky rent their house to the Williams family (from The Danny Thomas Show), but when their own plans fall through, the Ricardos are forced to stay next door with the Mertzes. Busybody Lucy annoys Danny and all three families wind up in court after a massive snowball fight. Written by Bob Schiller, and Bob Weiskopf. Directed by Jerry Thorpe. Danny Thomas and his TV family cross over in a memorable episode that has several outstanding moments. Lucy and Ricky’s travel plans fall through right after they have rented their house. While they stay with the Mertzes, Lucy’s constant pestering leads to annoyance for the Williams family. Trying to get them out, Lucy ends up in a compromising position when a tired Danny, thinking she’s Kathy, kisses her neck and spanks her. This snowballs into a snowball fight, and then ends in a big courtroom scene with all three couples. Gale Gordon, a future Lucy regular plays the judge. Lucy, having lost her voice, gives a tour de force testimony via pantomime. One of my favorite lines, however, again belongs to Ethel. After each couple tells the judge which kid(s) belong to them, Ethel gets up and says: “We raise chickens.” Funny episode, especially if you are a Danny Thomas fan. 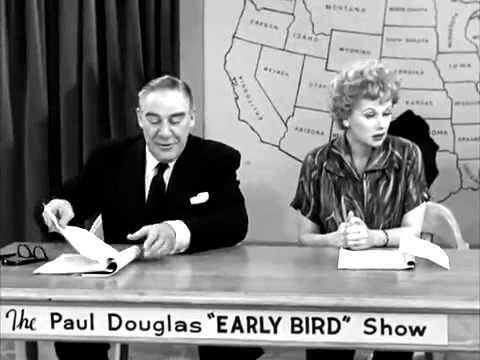 Tired of being a housewife, Lucy lands the role of Paul Douglas’s Girl Friday on his new morning show, after scaring off the younger competition. Though her first show is a disaster, Lucy becomes a big hit — but now she doesn’t have any time to spend with her family. Written by Bob Schiller, and Bob Weiskopf. Script Consulting by Madelyn Martin and Bob Carroll, Jr. Directed by Jerry Thorpe. This was the last full episode shot entirely in front of a live studio audience, and it’s a special one. Though Ethel and Fred have smaller roles this time, the story doesn’t miss them. Lucy gets a job as a Girl Friday by scaring off the competition. Then she makes a fool of herself on the air with a hysterical bit involving a weather board. Fortunately for her, the sponsor loves her and signs her for a contract. But she soon finds herself missing Ricky, whom she only sees when they meet in the evenings at the train station. Paul promises to get her out of her contract, so Lucy goes home to bed and takes sleeping pills. But when the sponsor demands she come in to work, a groggy Lucy proves to be a bigger challenge than waking Lucy. With many fabulous bits, this episode, even more than the actual finale, brings the Ricardo characters full circle. Lucy mentions in the beginning that she might return to show business. Her desire to perform was the show’s driving force in early seasons, but hadn’t been mentioned since late 1956. It’s thrilling to see it, not only brought up again, but acknowledged as a story that hasn’t been used in a while. So this episode gives Lucy exactly what she wants — fame. Unfortunately, she misses her family. A funny episode, but also a sweet one. And I don’t normally like sweet ones, but there’s a sense of completeness after this outing that’s very satisfying. I recommend this one ESPECIALLY for fans of the half-hour series. In Japan, Lucy secretly buys pearls from Bob Cummings, who just happens to be in the hotel room next door. But a misunderstanding involving fake pearls leads Lucy and Ethel to a geisha house, where they find Bob with Ricky and Fred. Written by Bob Schiller, and Bob Weiskopf. Script Consulting by Madelyn Martin and Bob Carroll, Jr. Directed by Desi Arnaz. This episode was not shot live and it shows. All of the performers look tired and there’s a general air of sadness that extends through these last few episodes. Despite this, the script is pretty funny with a couple of great moments. An early bit with Lucy and Ethel spying on Bob Cummings while he bathes is incredibly amusing — especially when they fall through the paper walls. 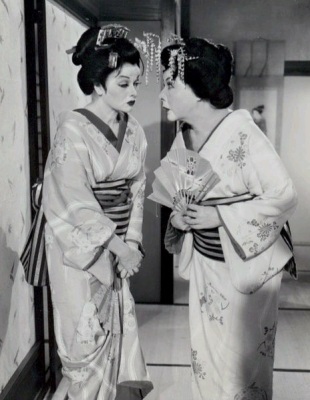 But, of course, the best stuff occurs at the end when Lucy and Ethel dress up as geishas and sneak into the geisha house to find Bob Cummings. Lucy is forced to participate in this riotous dance that may be one of the best physical moments of her career. This episode, coming so close to both the end of the series and the Arnazes’ marriage, is a surprise. It has all the right ingredients for a fantastic episode, and if the performers were more into it, it would be. Regardless, this is a funny and underrated episode. Well, that’s the end of Lucy Ricardo’s best episodes. Next Tuesday we start fresh with the best episodes of The Honeymooners’ Classic 39! And remember to come back tomorrow for a new Wildcard Wednesday post! Pingback: BIRTHDAY BASH: The Redhead’s 103rd | THAT'S ENTERTAINMENT! This is actually my first time posting here, but I’ve been relishing your Sitcom Tuesday posts for well over a year now. I can’t tell you how much I admire and respect your breadth of knowledge of these classic sitcoms — your insight is just marvelous. This is, without a doubt, the best blog/source I have found for even-handed, informed, passionate writing about the finest sitcoms ever made. Thank you for sharing your zeal with the world. It’s better for it, I can tell you that. I long for the richly drawn characters and big laughs of yesteryear’s situation comedies and take great comfort in the fact that an astute young writer such as yourself is pounding the pavement every day in an effort to bring the magic back to the wasteland of quick edits, cheap/easy/crude jokes, and poorly defined characters that inundate the landscape of situation comedy today. Keep at it! I look forward to seeing your name in the credits of a future quality sitcom. I will live vicariously through you! Regarding The Lucy-Desi Comedy Hour specifically, I had a question that I can’t seem to find an answer to, though I’ve searched high and low; I thought you might be able to shed some light or provide some insider info on this. I took note when re-watching I Love Lucy this past summer in its entirety (while following along with your posts; this has become a new pastime of mine!) that legendary Lucy writers Madelyn Pugh-Davis (credited Madelyn Martin by the time of the hour shows) and Bob Carroll, Jr. are simply listed as “Script Consultants” after the 1957-1958 year (which I view as clearly the strongest). I did a bit of research on IMDB and saw that the pair did continue to work for Lucy on The Lucy Show, Here’s Lucy, and even Life With Lucy, so I assume there was no rift to speak of during the Comedy Hour years. It is curious and unfortunate that they apparently stepped down as head writers in the last stretch, as the Tallulah episode, for me, is my favorite I Love Lucy episode, PERIOD. The Fred MacMurray uranium chase is a riot, too. I just saw Double Indemnity for the first time this past summer (at the TCM-sponsored theater showing — what a picture! I had never even heard of it) and now I feel like I’m “in” on the joke when Lucy says something like “You know, I haven’t trusted trusted him since I saw him in Double Indemnity” (LOL) Lucy Wins a Racehorse was also, upon re-watch, a standout for me. When Lucy and Ethel are on the stairs (“What horse?” is such a surreal moment, so farcical that I can’t help but fall for it. And as a longtime student of Japanese studies, I can’t help but get a kick out of the entire Japan episode — the money belt fiasco, the umbrella dance, Bob Cummings in the tub, and the final “ETHEL, THE JIG IS UP!” busting through the paper walls. It’s gold! The Comedy Hours really are sadly underrated and written off by so many, from what I can tell — no, the quality isn’t up to par with the original series (barring Tallulah and Fred, in my opinion), but it’s really too bad that some fans don’t give these a chance. I do agree that there’s something special about Lucy Wants a Career (which I now appreciate all the more after having familiarized myself with the amiable Paul Douglas’ work in A Letter to Three Wives — tragic that he passed so soon after the taping of the Lucy episode). It would be a fitting series finale in a lot of ways. As you said, it’s very sweet. Here I ramble, but I do appreciate you taking the time to read my comment (I plan on making a few more on other shows I’ve watched — finally jumping in!) and thank you in advance for any insight on what might have happened with Bob and Madelyn in the final two years. P.S. How neat is it to see the incomparable Jay Sandrich in the credits as assistant director on season six of I Love Lucy and again here for the hour longs? What a way to start! No wonder! Hi, Izak! Thanks for reading and commenting — I’m glad you’re here! In the later COMEDY HOURS, Davis and Carroll are credited as “Script Consultants,” which basically means they gave input and helped oversee the quality of each script (not unlike what Oppenheimer originally did on I LOVE LUCY), while Schiller and Weiskopf as the junior writers physically wrote each episode. The only episode on which Carroll and Davis are not credited is “Lucy Goes To Mexico”; the pair went into retirement after the 1957-58 season, only to be lured back by Desi for the year’s four remaining episodes. As Script Consultants, they were basically given a promotion. They would essentially perform the same functions at the start of THE LUCY SHOW, however all four were again credited as writers. The rift between Ball and the team didn’t occur until 1964 at the tail end of THE LUCY SHOW’s second season. Davis and Carroll wouldn’t write for her again until 1970 when she called them up to prepare a special script for the big Burton/Taylor episode that was pushed up to be HERE’S LUCY’s third season premiere. good choices but why did you not even mention my fav episode from this series Lucy Wins a Racehorse? I love that one the horse is funny and sweet and Lucy is at her best here and plus i believe this is the last episode we see Little Ricky? Hi, Jenny! Thanks for reading and commenting. I didn’t mention “Lucy Wins A Racehorse” because I don’t, in any way, consider it one of the strongest installments of THE LUCY-DESI COMEDY HOUR. While I like some of the stuff in the first half, I think the final comedic centerpiece is a loud, unmotivated letdown that neither features Lucy at her best nor uses the show’s other assets (Ricky, Ethel, Fred) to its advantage. Also, Little Ricky appears in nearly every episode of these hour-longs — his last appearance comes in the series’ final installment, “Lucy Meets The Mustache,” in 1960.
ok well we each have our opinions-what series do you plan to do in the future? This weekend I am currently watching Hot in Cleveland on dvd have all seasons. So far imo the best episodes from the series were the great pilot episode, Birthday Dates where Victoria got a date with a guy appropriately named Chester and Melanie wound up with a man obsessed over her resemblance to his dead wife and Funeral Crashers where Melanie wants to get back her “magic dress” which got sent there by the dry cleaners by mistake-problem is the dress is on the dead person in the funeral casket lol-and Victoria wants to get a copy of an old issue of Soap Opera Digest that the deceased has (she collected every issue of the magazine) because she was on the cover. I also like how Hot had so many guest stars of tv and music such Rick Springfield, Huey Lewis, Mary Tyler Moore and so many others. If you haven’t reviewed this series do it next please. Check out the Coming Attractions page to see what Sitcom Tuesday series you can expect in the near future. Right now I’m currently working on shows that premiered in the 1990s — with a brief upcoming return this September to the ’80s for the recently released NEWHART. After about two more years of ’90s coverage, I plan to circle back and fill in some missing links from the ’50s and ’60s (like BURNS & ALLEN and GET SMART). I currently have no plans to discuss any comedies that debuted in the 21st century, but if I decide to do so after returning to this earlier era (years from now), HOT IN CLEVELAND will be in contention. i like mostly 70s and 80s sitcoms more than current ones-Hot in Cleveland is one of the few more recent series I consider truly good. Perhaps it is because of its great cast with vets like Valerie Bertinelli and Betty White among them, the many great veteran greats who guest appeared throughout the series and the overall good writing for its 6 year run on tv land. btw a lot of tv shows which only got one season or partial release can be gotten on other sites like ioffer.com I got off there Who’s The Boss?, One Day at a Time, Archie Bunker’s Place and The Wonder Years off there in their entirety and for great prices no less and not having to buy one season at a time. Anyway I will look forward to your future reviews and hope you consider reviewing Hot in Cleveland for consideration even if it not an “old school classic” it has the makings of being one someday. I’ll definitely consider it! It’s in my collection and I was in the audience for the production of one of its final episodes. you can get all the seasons on dvd on ebay all are available. guest star reasons to love Hot in Cleveland-for Mary Tyler Moore Show fans, many cast members made appearances, especially Georgia Engel who became a semi regular cast member in season 3 as Elka’s best friend. Carol Burnett later appeared as Victoria’s mother and Jennifer Love Hewitt guested a few times as Victoria’s daughter. And of course Susan Lucci made several appearances. Huey Lewis made several appearances as Victoria’s on and off boyfriend, Rick Springfield appeared as someone pretending to be him so he could bed women including Joy. Carl Reiner was in many episodes as Max, one of Elka’s many men. Bonnie Franklin, Valerie’s ODAT tv mom appeared in an episode as the mother of one of her men who btw was played by John Schneider. Juliet Mills appeared in many episodes as Joy’s mother. Heather Locklear played Melanie’s boss for a a few episodes. James Patrick Stuart who is now currently on General Hospital as Valentin Cassadine played Collin, Victoria’s talk show co-host who also bedded Joy. Tim Conway appeared as another of Elka;s beaus. Another of Elka’s men was Regis Philbin. Jack Wagner showed up for a few episodes dating Melanie. And the list goes on and on of so many talents showing up for great episodes. Definitely take a bit of time out to review this series-and soon I hope. Well, Jenny, as I said, it won’t be soon. I’m currently examining shows that premiered in the ’90s. That’s going to be at least two full years. Then I’m returning to the ’50s and ’60s. If I move into the 21st century, then HOT IN CLEVELAND becomes a possibility — but that’s a decision currently projected for 2021. In the meantime, stay tuned for THE LARRY SANDERS SHOW, NEWHART, and WINGS, all coming up here before 2017 concludes.